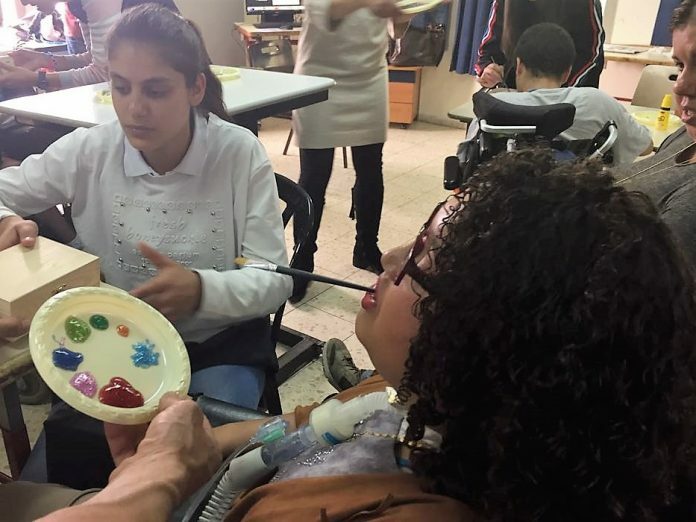 A student in the disabilities inclusion program at Ono Academic College in Jerusalem works with a community member on a painting project. Credit: Ma’ayan Gutbezahl. The Israeli-Palestinian conflict has dragged on for so long and with such persistence that many have begun to wonder if it is has simply become Israel’s new “normal.” Despite the constant fighting and amplified tensions between the two populations, some hopeful pockets of coexistence do exist. One such example can be found at Ono Academic College in Jerusalem, where an experiential education program focused on disability inclusion brings together young Jews and Arabs to develop educational programming for a segment of society that is often neglected. The program was created by Dr. Noorit Felsenthal-Berger, a psychologist who began her career by comparing the maternal identity of secular and haredi (ultra-Orthodox) women. Her comparative research on different groups within Israeli society eventually led her to focus on students with special needs — those who learn differently than the general population and are largely underserved. Bringing her expertise to Ono, Felsenthal-Berger created a hands-on program in disability studies that quickly became popular with young Arab and Jewish students who were trying to understand their own identities within the complex milieu of Israeli society. “Many of my students have never even met someone with a disability before they join my program, and their experiences are often rather jarring at first,” she says. These experiences impact the students so significantly that they often consider quitting the program early. However, they rarely ever do. Felsenthal-Berger explains that this initial hesitation is typically followed by dedication and perseverance once the students take some time for introspection and begin to understand the importance of the task at hand. “Learning to work with people who look and behave very differently is challenging, but they instinctually realize that sticking with this work is a societal imperative that is also personally rewarding,” she says. Together, the diverse group of students tackles 100 hours of field work in special education, engaging in hands-on experiential learning activities with groups of children with disabilities at different sites throughout Jerusalem, which culminates with a capstone workshop. Perhaps the most important element of the program is that the students are given the freedom to create and initiate projects of their own for the children and communities to which they are assigned. “The projects are an opportunity for students to look outside of themselves and see the inherent humanity that all of us possess, no matter how different that other person may seem on the outside,” says Felsenthal-Berger. The experience extends beyond the scope of the projects developed for the children with disabilities to the team members themselves, a collection of students with diverse backgrounds. Working side by side in the classroom and on the same projects in the field, the intense emotional experience, which is void of politics, unites the Arab and Jewish students, allowing them to see beyond their cultural differences and work towards a common goal for the greater good. Many of the program participants grow up believing that they will never be able to change Israel’s “status quo,” and that there is a possibility that Arabs and Jews will always be at odds with one another. Yet through their work with the disability community and each other, they become galvanized in ways that allow them to make positive changes, realizing that they have the power to forge their own paths in life and influence the world around them. Rasha Aliyan, one of students in the program, was raised in the eastern Jerusalem Arab neighborhood of Beit Safafa. For years, she lived next door to a boy with disabilities but rarely interacted with him. After joining the disability-studies program at Ono, she became interested in learning more about her neighbor and made an effort to get to know him. Rasha also became a mentor to a 16-year-old girl, who is blind and has cerebral palsy, at Ilanot, a school for children with severe disabilities in western Jerusalem. Although the girl is from Beit Safafa, Rasha had never crossed paths with her prior to meeting her at Ilanot. Rasha’s interactions with individuals with disabilities in her own community inspired her to create her own project, which would partially integrate Ilanot students into Beit Safafa public schools in an effort to bring the community’s children together. “I come into class and my students are all so excited to see me—to see someone who knows them and who accepts them. Our connections are real and mutual, and I have realized that there isn’t much of a difference between us after all,” she relates. While working to promote disability inclusion and education in her community, Rasha also became friends with many of the Jewish students who collaborated with her on the Beit Safafa project, realizing that they were also not nearly as different as she had been led to believe in her youth. “We all had an amazing connection throughout the course. We worked well together and learned a lot from each other. In the end, we realized that our differences weren’t so drastic, and we had more in common than we could have ever expected,” says Rasha. While Jewish-Arab friendships remain taboo throughout much of Israeli and Palestinian society, personal experiences can prove lasting and powerful. They can be used as a tool to chip away at a status quo steeped in conflict and tension, and make way for a brighter future. For Ono’s disability studies students, those experiences have changed how the young participants view each other and reshaped their worldview.